"Harrumph, Harrumph!" - I "can" hardly contain my enthusiasm for another one of Oskar Blues big beers. 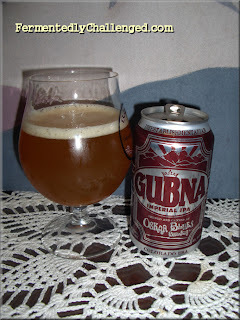 Here is another in a series of reviews of craft beer from a can: Oskar Blues Gubna Imperial IPA. 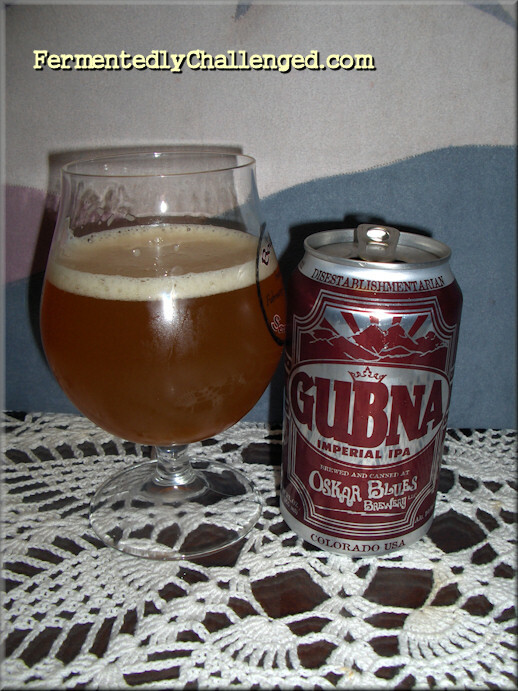 Oskar Blues Gubna is a heavyweight of an IPA. It weighs in at a big 10.0% ABV and a near maximum 100 IBUs. You don't get much bigger than that, especially from a canned craft beer. The imperial (or double) IPA comes wrapped in a 4-pack and cost around $15 for the set. At this price I'm expecting a lot from this beer. Would O.B. deliver? Oskar Blues rotates Gubna with their Ten Fidy for half of the year, but you can probably find this beer on shelves year round if you look. While it may have a high ABV rating, you'll probably want to drink this one within the first 6 months of canning. Gubna is one of the latest brews from Oskar Blues to be put into a can. Something tells me that there will be even more in the future. Appearance: Gubna poured a semi-cloudy dim orange with a small 1-finger off-white head. Oskar Blues describes it as a light amber color but I beg to differ. There was no hiss when opening the can but the beer was still fresh with bubbles. I couldn't see through this beer but there was no sediment in the glass. When swirled, the small head rose a bit once again but left little to no lacing. Aroma: Oh my! The gigantic hop smell on this beer was about as big as I've experienced. There was a ton of resiny pine, mild spice and grapefruit citrus on the nose. Even without looking at it you could tell this was a big IPA. It was a strong yet very inviting aroma. Taste: Boom! The hoppy grapefruit flavor hit me sup side the head and wouldn't let up. There was a huge malt taste mixed in with a refreshing bitter hop punch. O.B. put only Summit hops in this brew - one of the highest alpha acid hops there is (17-19% AA). The malt imparted a dry yet slightly spicy taste. It's big, full-bodied, dry, spicy, citrusy and finishes clean. I chose to pair it with some hot spicy chips and salsa. Wow, what a combo. Gubna attempts to quench the salsa burn and gives you a hop attack in return. Woo!! Overall: I'm rarely disappointed with any Oskar Blues beer. They seem to go big every time and get away with it. While I'm a bit put off by the cost, I can understand why they may need to charge a bit more. They must put 2 to 3 times the normal ingredients into this beer than other brews. This was a very satisfying Imperial IPA. I'm glad that my palate had been trained for such a hop monster, otherwise I might not be able to enjoy it's big taste. No doubt about it, this is not for you yellow fizzy macro brew drinkers as it will not pardon your virgin taste buds. As for me, I loved it. I don't love every big IPA I come across but the Gubna certainly got my vote. Cheers Oskar Blues!